Best Gainesville Area Rug Cleaners, Free Quote! Don’t be fooled into thinking that your area rugs are never going to get stains – even if they are labeled stain-resistant. Call a profesional area rug cleaners for an evaluation before area rugs are cleaned. Each time someone walks on your area rugs, a tiny bit of damage occurs. While your area rugs might not become visibly flawed, their fibers might experience minor crushing or staining that hasn’t yet become apparent. It’s true. Just wait a few more months and you’ll begin to notice a difference. Once you do see the changes, it is time to arrange for your area rugs to get a thorough cleaning from professional area rug cleaners in Gainesville. Why Bother Cleaning Area Rugs? The most obvious reason to hire area rug cleaners in Gainesville is to restore the attractiveness of your rugs. Professional carpet cleaning can remove a pound or more of dirt, depending on the size of your rugs. Once the dirt is removed, the carpet’s fibers become less compacted, allowing them to bounce up and look almost new! The second reason that you should have your rugs cleaned is for the removal of contaminants that can pollute the air that you breathe, making you sick. As your skin sheds dead cells, they fall into the carpets, providing dust mites with the nutrition they need to set up house in your rugs and upholstery. Professional area rug cleaners can minimize this risk for you by efficiently eliminating dirt, debris, and spent skin cells from your rugs and even from your upholstery. Since your area rugs catch a lot of the dirt tracked in from the outside by people’s shoes, they are the first step in protecting the attractiveness of your hardwood floors and wall-to-wall carpeting. 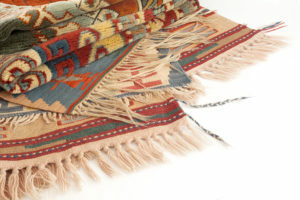 Typically, the dirt that goes into your rugs stays there until you either vacuum it out or have professional area rug cleaners from Gainesville handle the task for you.